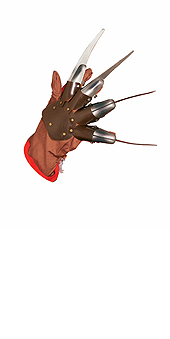 Recreate your favourite moment from A Nightmare on Elm Street movie with this harmless but effective Freddy Krueger Glove. Freddy's Glove has given people nightmares for years but this this glove accessory the blades will only scare, not carve! *One Freddy Krueger glove with plastic blades on each finger. Fabric hand cover, plastic blades and plate on back of hand.